INTI is collaborating with the number 1 hospitality management school in Asia Pacific and Australia* – Blue Mountains International Hotel Management School (BMIHMS) – to provide students with a qualification that will help meet a growing demand for qualified personnel in the local and regional hospitality and tourism industry. (from left) Tan Ling Ling, Chief Executive of INTI International College Subang; Amit Sevak; Guy Bentley and Michael Huckaby at the launch of the Bachelor of Business in International Hotel & Resort Management degree. The new 3-year Bachelor of Business in International Hotel & Resort Management degree provides broad business-focused education and training in all key aspects of hotel and resort management. The syllabus includes practical skills development where students have the opportunity to learn in a simulated hotel environment. Students are prepared for supervisory and management trainee positions on graduation in the hotel industry, particularly in resorts, as well as associated accommodation, hospitality and tourism sectors. With a strong focus on driving innovative learning and international exposure, the Blue Mountains degree leverages on the use of technology, including video conferencing, in creating global classrooms where students at INTI can exchange ideas, interact and build a network with their counterparts at Blue Mountains in Australia. With an embedded study trip to any of Blue Mountain’s institution in Asia, students are able to engage with fellow hospitality students in the region to enhance their understanding of the Asian hospitality industry. On hand to launch the programme at INTI International College Subang were Guy Bentley, CEO of Blue Mountains International Hotel Management School; Michael Huckaby, CEO of Laureate Hospitality and Culinary; and Amit Sevak, CEO of INTI. Both INTI and BMIHMS are part of Laureate International Universities, the world’s largest and fastest growing network of private higher education institutions. “Malaysia is an important market for Laureate and the hospitality and tourism sector holds tremendous potential for the country. With Laureate’s backing, INTI is in an excellent position to contribute to the Malaysian government’s effort to attract 36 million tourists to Malaysia and generate RM168 billion in revenue for the country by year 2020. We are eagerly expanding our efforts with the Ministry of Tourism and Culture to ensure the success of the Malaysia Tourism Transformation Plan,” said Amit Sevak. INTI’s partnerships with industry players include those with the Malaysian Association of Hotels Training and Education Centre (MAHTEC) for industry certification for hospitality graduates; Dorsett Hospitality International for training facilities and other learning resources at INTI Subang; Hard Rock Hotel for internship programmes and other learning opportunities at INTI Penang; and Shangri-La Tanjung Aru & Spa and Hyatt Regency Kinabalu for support for a work based diploma in hotel management in Kota Kinabalu, where INTI is Malaysia Center for Tourism & Hospitality (MyCenTHE) cluster leader in Sabah. “INTI’s collaboration with BMIHMS sets yet another benchmark in Malaysian hospitality education and human resource development. 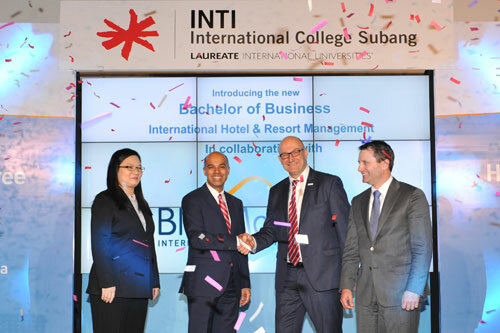 The new Blue Mountains degree leverages on INTI’s global network of academic and industry partners and advisors, including international 5-star hotels and hospitality establishments. The new degree is expected to draw international as well as local students, and enhance Malaysia’s status as one of the world’s most popular destinations for education and tourism,” said Amit Sevak. * Survey by Taylor Nelson Sofres (TNS) PLC, UK, 2013.